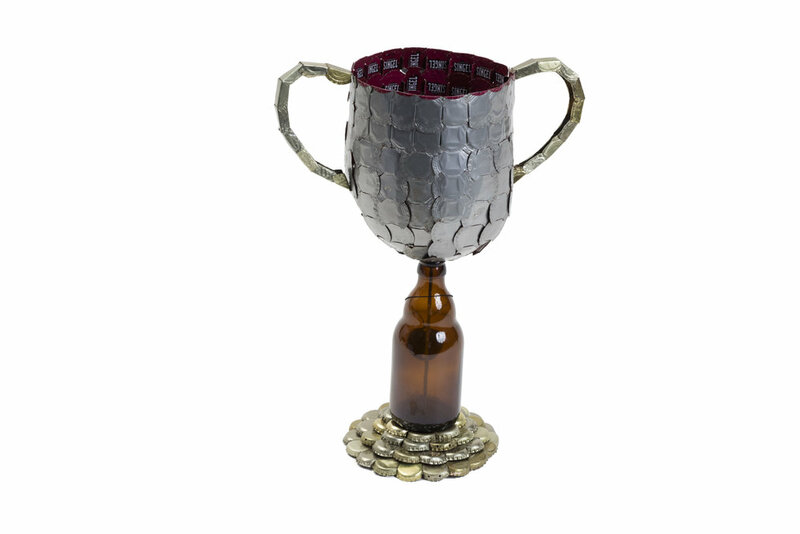 This was commissioned as trophy for a home brewing competition. We didn't want to any particular beer to be associated with this competition, so we used gold caps and the underside of Hardywood caps. There is a threaded rod holding the whole thing together. No, it doesn't hold liquid. We made this for the bottle cap donations we receive at the farmers market. We first made a flat mesh out of Legend caps and then fastened the flattened Hardywood caps to fill the negative space. Next, we connected one end to the other to make a cylindrical loop. Then we added the Bud Light bottom. The last step was to add the letters (made from beer cans) and business card holder. It was 100% caps with nothing extra keeping it together. We added plywood to the bottom so it wouldn’t scratch any tabletops.